Our little condo has a closet for the Laundry Room and I just didn't like it, plus I couldn't reach the shelf without being on my tip toes ! we don't use it. Than went to Lowe's Want to see a grown man shiver in his work boots ? Walk into Lowe's with a yellow legal pad, tape measure and pictures from pinterest ! ! ! Yes, it was a metal tape measure not cloth, I've learned, they will laugh out loud at you, I know I did it....once. My drying time was less with the cabinets in the air conditioning, in the garage and in Florida, it would have taken quite a bit longer for them to dry. Trick ONE, I get the better brushes HERE, NOT the cheap ones from Lowe's. They wash great and no hairs come out like the other ones ! Trick TWO is a BROWN paper sack, paper is the finest sand paper. BUT, it must be a BROWN sack. 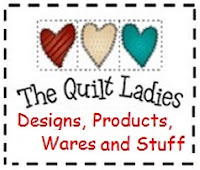 The only one I had in the house was from a little quilt shop in McKinney, TX, Stitched with Love, their site. Cut the sack open and I like to fold it in and use just as sand paper, it makes the paint and wood soft ! How often do you move your washer and dryer? I'm going to have to do it more often...it's been 5 years for me. And, from the looks of it, too LONG ! I'm have so many idea's yet to do ! What size cabinets did you use? I love your laundry closet! I too have one in my condo in Lake Placid Fl . I have a coupe questions. Did you leave the doors on after you were done? Also did you use the paper bag to sand the cupboards before or after painting or both? I plan on replacing my washer & dryer as mine is too noisy being close to the living room. I may get the front loader and put a counter over both. Thank you for your idea and for sharing how you did it. Hello, use the brown paper sack, before paint and after if you like a smoother feel. And yes the doors are on, our guest bath door is right across from laundry closet makes it a bit hidden. Good luck, go slow and enjoy the process. Can you tell me what size the closest was. Standard laundry closet, it was already my laundry! Where did you get the cabinets and what size are they? Thanks!